Cozart was diagnosed Tuesday with a Grade 1 calf strain, which is expected to sideline him for a few weeks, J.P. Hoornstra of the Los Angeles Daily News reports. Cozart's injury had originally been described as tightness, but it turns out the issue is more significant and will force him to miss more time than expected. 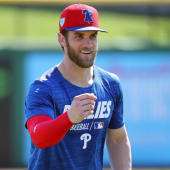 The somewhat vague timeline puts his return date right around Opening Day, though it may be unlikely for him to be available at that time without a minor-league rehab stint beforehand. A cautious approach would be wise for the Angels, as Cozart was limited by injuries to just 58 appearances last year due to an entirely unrelated torn labrum in his shoulder. If Cozart does miss time to start the year, Taylor Ward, Tommy La Stella or Kaleb Cowart could benefit.